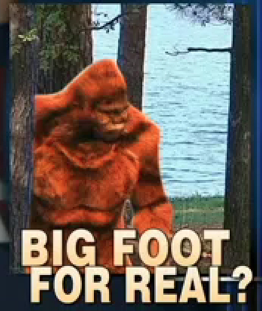 CRYPTOZOOLOGY ONLINE: Still on the Track: LINK: Does Sasquatch (Yes, Bigfoot) Roam the Forests of New England? LINK: Does Sasquatch (Yes, Bigfoot) Roam the Forests of New England? Over the years, the majority of sightings of the elusive Sasquatch have been limited to the American northwest. In the last three decades, however, many more encounters have occurred in the northeastern sections of America, particularly upstate New York and New England. Actually, these sightings are really not new to the area; they just haven’t received as much publicity as other occurrences in the Pacific Northwest. The Algonquin Indians for hundreds of years have reported creatures they named Stone Men and Giant Men. The descriptions rarely varied; about 7 feet tall with glowing red eyes, a putrid smell and sounds that resemble a pig squealing. Author Paul Bartholomew and his brother have researched the Bigfoot question meticulously for decades and have published their findings in a book released earlier this year entitled: Bigfoot Encounters in New York and New England.